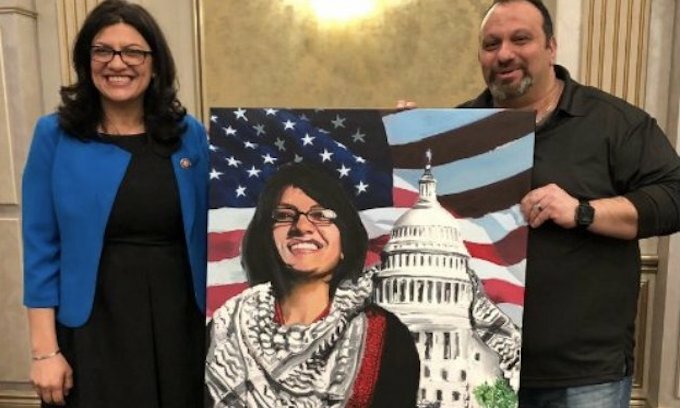 Rashida Tlaib with pro-terror Hezbollah's Abbas Hamideh at congresswoman's swearing-in ceremony. “Criminal Zionists are going apes–t over one picture. Imagine when we take selfies in a liberated Jerusalem?” Mr. Hamideh tweeted. The newly elected member of Congress has drawn headlines during her first few weeks in office by calling President Trump a “motherf—-r” and supporting the anti-Israel Boycott, Divestment and Sanctions movement. The camel’s nose has slipped under the tent with this character. I only hope that Michigan has a recall law that should be invoked. Time for a new Sedition Act. I believe all of the Socialist Progressive Party would qualify. This one needs to find herself at Gitmo for 5 to 10. Michigan is being taken over by Muslims. That’s their SOP when they can’t take something by force. At this point, a civil war is all but inevitable (and probably necessary). Better yet, find her head, placed on a 10ft long SPEAR, spiked outside the Congressional building. She needs to go…one way or another! more and more i see america fading away to the ashe heap of history under the guise tolerance and diversity. i can not believe the american people have let this happen. the american left with there race baiting,bullying and flat out destroy you for your intolerance to there beliefs.as i look around the nation we are being encircled by the left coast of californiagrad and the east coat by new yorkistan ,bostonia,washingtonscow, and its like creeping death. say goodbye to the best country ever she is leaving. And more and more, i wonder, WHY i gave 20 years to defend this nation, when our politicians, and brainwashed students, seem to be willing to give it over without a fight.. This piece of crap needs to be taught a lesson, one she will never forget. Needs to be deported immediately, not fit. America, they are here, they are here! There is no escape. Wake up, listen. Look. IMO its getting to the point, where it feels TOO LATE. Even if we start “waking folks up”, unless the country’s ready for another bloody civil war, we won’t ever oust this muslim cancer in our midst. Michigan is full of people like her, that how she got elected! All because our country has allowed Sharia enclaves to take root across our land. If Steve King is being censured for his white nationalist comments, why isn’t this Muslim being censured for calling the President a MF, and pro-Hezbollah comments and associations????????!!!!!!!! Because like with everything else in this upside down world, When minorities do it, its all a-ok. If a male/white/conservative/christian does it, ITS Bad/wrong/racist/sexist/bigoted etc.. I don’t agree with the idea of white supremacy; and frankly, I have no idea what “white nationalism” even means. It seems that the double-standards surrounding “hate-speech” are rapidly expanding. “Lying to the FBI” got Scooter Libby and Michael Flynn fired and then hung out to dry by the DOJ…not so with Hillary and anyone with a “D” after their names. A Republican Senator says something a bit stupid and he is hammered immediately. A Democrat supports terrorism and gives terrorist supporters a seat at the table, Silence. Great! Now we have a committed Communist and a Muslim Terrorist in congress. America is going down the tube! She’s only following in OBOZO’s footsteps. There is a reason the US is a republic and not a democracy. I don’t care how many terrorists live in MI, US-hating people cannot be in Congress. If you believe in the Quran then you cannot support the Constitution. If you say you will uphold the constitution then you are a lying Islamist who should not be allowed to run for public office. Wake up America while there is still time.